Corruption and the manipulation of sports competitions are now in the sights of justice thanks to the new provisions that came into force on 1 January 2019. NOVEMBER 2018 : Jorge Ibarrola moderates a panel on “New developments in anti-doping : International Testing Agency and CAS as first instance for anti-doping disputes”. NOVEMBER 2018 : Jorge Ibarrola lectures on “Selected Recent Procedural Issues Arising in CAS Arbitral Proceedings”. Jorge Ibarrola at LIBRA LAW is “a top lawyer” highlighted for his excellent experience representing clients including sports federations, athletes and football clubs, in both arbitration and litigation proceedings. Claude Ramoni is well versed in advising sports federations and athletes on a wide array of sports-related issues, and is considered particularly impressive when it comes to doping matters. 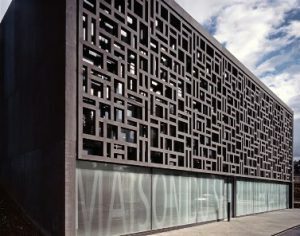 The next ASDS Sports Law evening will take place on 19 December 2018 at 6.30pm at the Maison du Sport International. Mr Jorge Ibarrola will have the pleasure of welcoming guest speaker Jean-Philippe Dubey, Head of the Scientific Department of the CAS and member of the ASDS Committee. Mr Dubey will discuss the decision rendered on 29 August 2018 by the Court of Appeal in Brussels concerning the arbitration clause in the FIFA Statues, in addition to the judgement of 2 October 2018 of the European Court of Human Rights in the Mutu and Pechstein cases. This will be followed by an open discussion between Mr Dubey and the participants. Participation is free, but only open to ASDS members. To become a member of ASDS: https://www.asds.ch/demande-d-adhesion and contact Mr Ibarrola (ibarrola@libra-law.ch). Mr Jorge Ibarrola had the honour to welcome Mr Bernard Welten, CAS Arbitrator and lawyer from Bern as guest speaker on the subject of the CAS Ad Hoc Chamber in PyeongChang as part of the ASDS Sports Law evenings. Mr Welten described the roles of the AD Hoc Chamber of the CAS during the Olympic Games, using decisions taken by the Chamber to illustrate his presentation, particularly those relating to the Russian athletes. The next Sports Law evening is likely to take place in June 2018. Participation is free but open only to ASDS members. To become a member of ASDS:. https://www.asds.ch/demande-d-adhesion contact Mr Ibarrola (ibarrola@libra-law.ch). 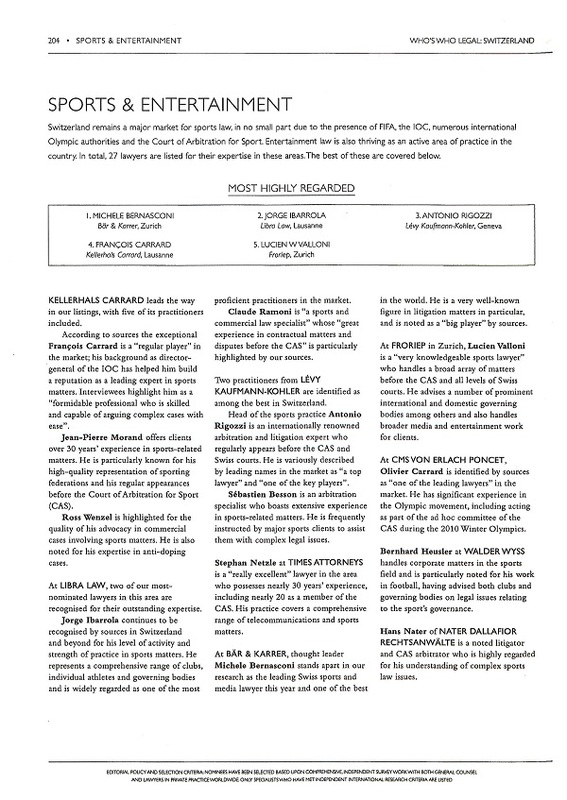 Jorge Ibarrola & Claude Ramoni are recognised as leaders in sports law by their peers in the 2017 edition of WWL. Libra Law congratulates the International Canoe Federation (ICF) for its success in the case Sergei Tarnovschi, whose appeal was dismissed by the CAS, which confirmed the 4-year suspension imposed by ICF on the athlete. See the CAS press release here. Libra Law congratulates the Turkish Football Federation for its success in the Case Trabzonspor, whose appeal was dismissed by the CAS, which confirmed the UEFA decision according to which UEFA had no jurisdiction to impose domestic sanctions resulting from the match fixing offences which occurred in 2010 and 2011. 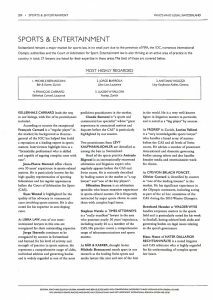 Who’s Who Legal 2017 also acknowledges Libra Law as a leading Swiss sports law Firm. 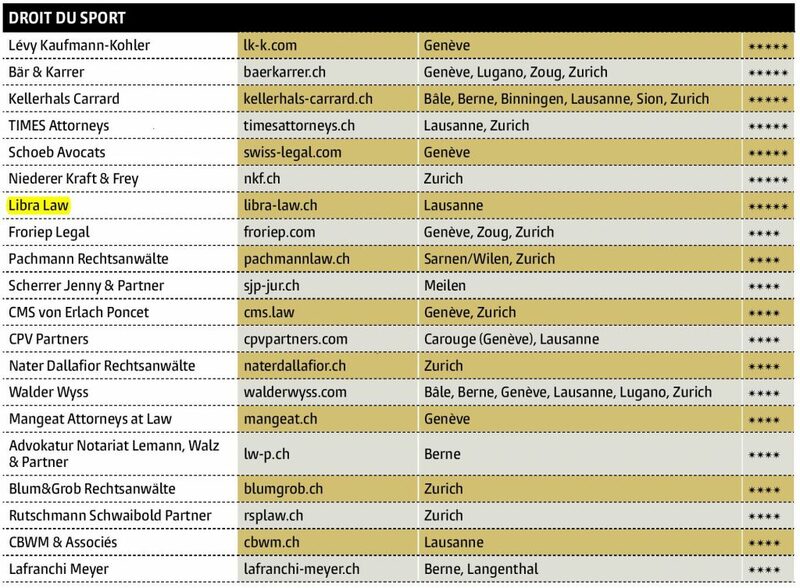 According to a peer review conducted amongst 6500 Swiss lawyers, LIBRA LAW is ranked within the seven best Swiss law firms in Sports law and is awarded five stars. This award means that our law firm is particularly regularly recommanded by our colleagues and clients. Jorge Ibarrola lectures at the Congress organised by the Escuela Universitaria Real Madrid. 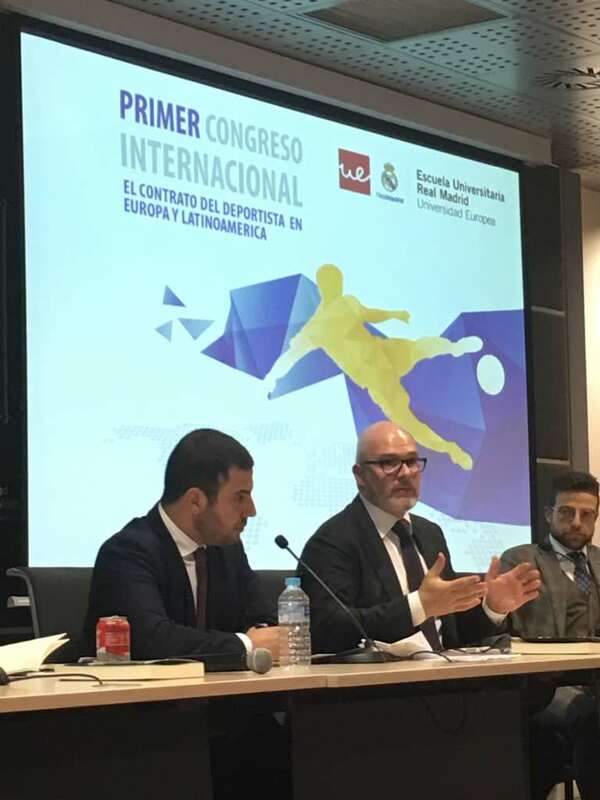 Within the framework of the Congress organised by the Escuela Universitaria Real Madrid, the authors of the recently published book "La extinción del contrato del deportista en Europa y Latinoamérica" presented on 16 February 2017 their respective contributions. 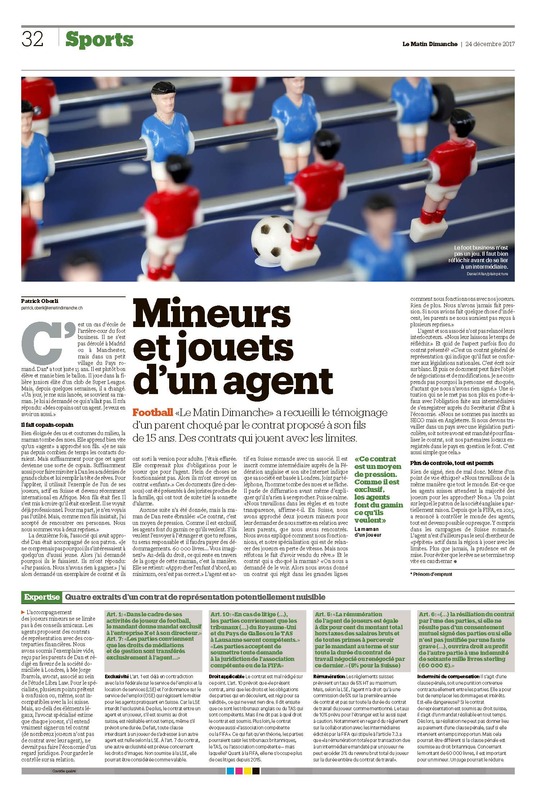 Jorge Ibarrola presented his chapter on the termination of the athlete's employment contract in Swiss law. 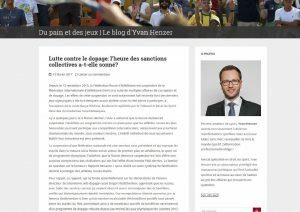 Yvan Henzer hosts a blog in the newspaper "Le Temps".